It isn't always just a matter of size! 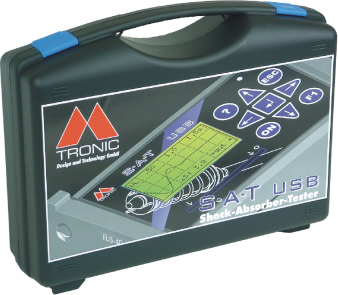 The S-A-T USB was designed as a time and money-saving method of testing shock absorbers whilst still fitted to a vehicle. This precision tool that is based upon ultrasonic distance-measuring technology has a home in every workshop and its optimal ease of use and operation mean that is easy to get used to. You can find a video presentation here. Defective shock absorbers have no chance with S-A-T USB and your customers benefit from greater safety, whilst your workshop increases its sales by replacing defective shock absorbers. No connection to mains electricity is needed, which means that you can test shock absorbers either inside or outside the workshop. The S-A-T USB is controlled by a powerful 32-bit processor and is also fitted with an LCD display, a rapid and robust thermoprinting system and a USB interface. The collected data can therefore be analysed, evaluated, displayed in the form of graphs and printed, either with or without the support of a PC. Easy-to-understand measurement reports then provide your customers with all of the evidence they need. Thanks to its comparatively low acquisition, operating and maintenance costs, the S-A-T USB will pay for itself within a very short time, making it a very lucrative and indispensible piece of equipment for your company.